What’s more to automate on oxy-fuel cutting then merely flame on/off? Oxy-fuel cutting is a reliable, accurate and competitive cutting technique used for the cutting of mild steel. What functionalities should you take into account when automating this cutting process? After all it’s about the quality of the entire fitting contour to reduce fitting and welding time. Before cutting, the cutting torch has to pre-heat the steel to ignition temperature at the starting point. At this temperature of around 960°C (depending on type of alloy), the steel has lost protective properties against oxygen and is still solid. Pure oxygen is then directed through the nozzle at the heated area. This fine and high pressure oxygen stream changes pre-heated and unprotected steel into oxidised liquid steel by an exothermic reaction. This slag has a lower melting point than steel, so the oxygen stream can blow the liquid slag out of the cavity without affecting the non-oxidised solid steel. This exothermic reaction is a continuous process and creates a cut as the torch moves. To keep the exothermic reaction working, the cutting torch keeps the steel heated during cutting. Only metals whose oxides have a lower melting point than the base metal itself can be cut with this process. Otherwise as soon as the metal oxidises it terminates the oxidation by forming a protective crust. Only mild steel and some low alloys meet the above conditions and can be cut effectively with the oxy-fuel process. Oxy-fuel cutting is a time consuming process, especially cutting thick walled materials. The shortest distance through the material is a cut perpendicular to the wall. In case of a beveled cut (an angled cut for weld preparation) the cutting torch will be at an angle and the heat transfer to the material will be less than that of a perpendicular cut and the cut length will be greater. This requires automation of speed control to maintain an accurate angled cut. Using an extra oxy-fuel torch (pre-heat torch) can be installed perpendicular to the material and running in front of the cutting torch can improve the cutting speed significantly (100% at 70 degrees cutting angle and 50% at 45 degrees cutting angle). To avoid unnecessary gas consumption this pre-heater should only be activated for angles steeper than 30°. Piercing is the initial penetration of the surface to be cut and uses the same exothermic process as used during cutting. After pre-heating the surface, oxygen will stream through the nozzle to change the solid pre-heated steel into liquid oxidised steel (slag). Spatter occurs during this process, because the oxygen blows away the slag upwards during piercing. This spatter can stick to the cutting tip and affect the gas flow and cutting process badly. 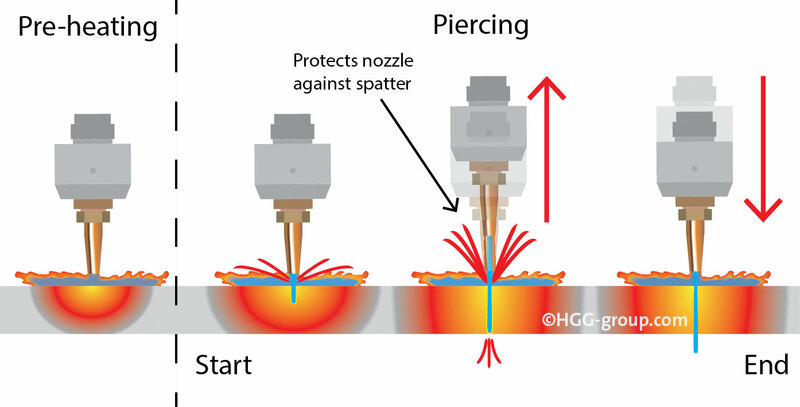 To protect the cutting tip against spatter during piercing, the cutting torch is moved upwards during piercing and as soon as the material is pierced, the cutting torch is moved back to the correct torch-to-material distance for cutting. 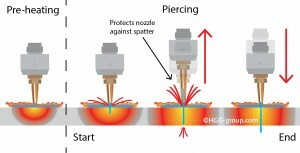 A variation to this piercing method is piercing with the torch positioned under a slight angle to protect the cutting tip from spatter but also to protect the underlying side of the cut material against spatter (e.g. inside of pipe). When cutting thick walled material it is difficult to define the perfect time and temperature to preheat so that even the deepest part of the material is heated to the correct temperature. It requires a lot of practice and experience. When thick material is pre-heated for slightly too long, the input of oxygen will cause a lot of spatter and create a large crater. This is due to the thick wall and excessive amount of liquid slag. On the other hand when insufficient pre-heating is applied, the full wall thickness will not reach the ignition temperature to maintain the exothermic process. The process will stop half way and the operator will have to try again at another starting point and the damage to the fitting contour will require a lot more grinding and welding. 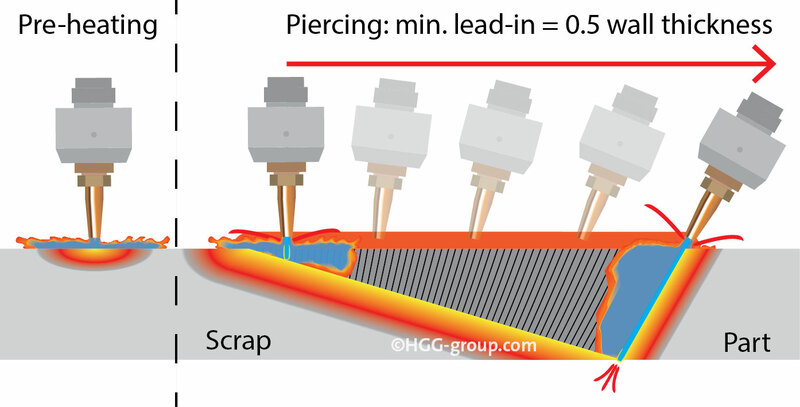 To automate this process a method called proportional piercing can be applied by which the oxygen flow is regulated in order to control the exothermic process during piercing. After a very short period of pre-heating to make the material surface reach the ignition temperature, the piercing process is started at a low oxygen pressure. As the torch starts moving towards the initialisation point of the programmed fitting contour, it gradually changes angle while at the same time the oxygen pressure is gradually increased to maximum pressure to keep the exothermic process running and to pierce deeper. The tilting creates room for the liquid slag also results in a minimum of spatter (protection of cutting tip). The start of a cut should always be done close to the actual fitting contour and into a so-called scrap-zone to avoid damage to the cut surface by piercing. The movement of the torch from the scrap zone to the programmed start position and angle is called lead-in. 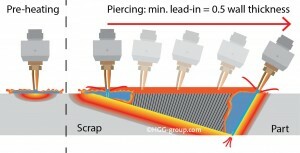 The movement of the torch into the scrap zone after completing a cut is called the lead-out. To make a smooth and controlled cross over from the start and the end of the cut (same point), the torch can be programmed to move radially in at start and also move radially out. Oxy-fuel cutting is used for the cutting of mild steel. Only metals whose oxides have a lower melting point than the base metal itself can be cut with this process. Otherwise as soon as the metal oxidises it terminates the oxidation by forming a protective crust. Only mild steel and some low alloys meet the above conditions. Oxy-fuel allows the cutting of thicker walled material then plasma. Plasma can’t cut thicker walls because of the huge amounts of energy necessary to reach similar thicknesses. Oxy-fuel allows cutting of steeper angles up to 70° (as compared to 45° with plasma) because of the concentration of the oxygen beam. The plasma beam has the tendency to deflect when the angle is too steep. However, this deflection could be compensated by automation. Oxy-fuel is a more economical solution than plasma cutting. Initial investment costs, consumables and operating costs are all lower than plasma cutting. However, processing speeds are typically lower below a 20 mm wall thickness range (considering 3D profiling in the heavy steel industry).